Posted on December 2, 2012 February 6, 2015 . by Patrick Johnstone. It’s inevitable, whenever discussion of traffic issues in New Westminster carry on for long enough, the topic of tunnels come up. Makes sense, as we are overloaded with traffic and there is no undeveloped space upon which we can build more lanes. So there is a portion of New Westminster population who figure tunnels are the solution to all of the City’s through-traffic woes. During the last Municipal Election, one mayoral candidate evoked the McBride Tunnel as the solution to the increased traffic that would be caused by expansion of the Pattullo Bridge. Captain Johansen told of a grander plan for tunneling the entire stretch of McBride to the legendary Stormont Connector. John Ashdown doubled-down on this idea by dreaming of a tunneled McBride, Stormont, and entrenched Royal Avenue. There are two criticisms common to all of these plans: they will cost a fortune, and they don’t solve any actual problems. Road tunnels in urban areas are notoriously expensive to build and connect to the existing road network, and what is being proposed would be the long road tunnels for Canada. McBride alone would be 2km, Stormont to the Gaglardi interchange another 2km. Add a trenched Royal Ave, and that’s 2 more kilometres. Each of these individually would be much longer than any existing road tunnel in Canada (the Massey Tunnel is just under 700m long, slightly shorter than the 730m Cassiar tunnel). Length isn’t the only problem. Tunnels in urban areas have to deal with decades worth of utilities under urban roads: sewers (storm and sanitary), water and gas pipes, electrical and communication ducts. Varying fill materials, shoring foundations, contamination, archeology: it’s a mess down there. Moving all of those things out of the way to push a trenched road through is expensive and difficult. Not to mention the disruption at the surface during construction. For this reason, shallow cut-and-cover road tunnels are often no cheaper than deeper bored tunnels, which can avoid these entanglements. You can ask the folks in Boston about these complications and how they can result in runaway costs. Transportation Engineers I have talked to have estimated $4 Billion for a McBride Tunnel and surface Stormont connection. I cannot imagine anyone at any level of government coming up with that order of cash to solve New Westminster’s little traffic inconvenience. Especially as these expensive tunnels are not likely to be an effective solution, but will only push the traffic pinch points a few hundred metres up the road to inconvenience another neighbourhood, or fill up our underground space with cars to go with our car-filled above-ground spaces. Anyone who thinks a bypass tunnel solves traffic problems has not spent enough time trying to drive through Seattle at rush hour. If cost -recovery programs are included, then the tunnels will simply be avoided, as the Brisbane experience is showing. There, a tunnel under an urban area built to bypass traffic lights and allow “free flow” is failing: going bankrupt only two years after completion. As we have learned with the Golden Ears Bridge and will soon learn with the Port Mann, people will tolerate a lot of inconvenience to avoid even a nominal toll. Car commuters are not rational in their choices regarding cost and time management. If they were, they would not be in cars, commuting. It’s a tautology. That aside, there is a place for tunnels in a developed urban environment, and maybe part of New Westminster’s traffic woes can be helped with judicious application of tunneling as long as we put trains, not cars, into those tunnels. Many of the costs and troubles related to road tunnels do not apply to rail tunnels. A 2-track rail tunnel can be as narrow as 10m, but for practical purposes, must be over 6m tall. A road tunnel can be slightly shorter, but would be significantly wider (the Massey tunnel is about 4.8m high, but more than 23 m wide). With trains running through them, not individual trucks and cars with flat tires, finicky engines, erratic drivers and “Baby on Board” stickers, train tunnels require less air-moving capacity, groundwater and seep control, fewer “safety features” like escape tunnels, buffer zones, lighting or climate control than car tunnels. Train tunnels, for all these reasons, are an order of magnitude less expensive to build than road tunnels (presuming, of course, that they can be bored deeper than the majority of existing utilities). The difference in cost is enough that it was rationally decided that if you want to take your car through the Chunnel, you need to park it on a train first. It is no secret in regional transportation planning circles that the biggest “pinch point” for goods movement is not New Westminster’s road network- it is the New Westminster Bridge. The 108-year-old steel swing bridge is the only rail crossing of the Fraser River this side of Mission. 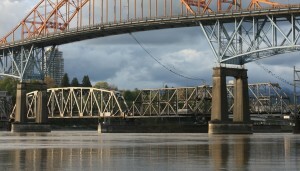 Even the regional transportation study back in 2003 that established the need for a “Gateway Program” identified the New Westminster Bridge as a high priority – the highest priority for all rail upgrades. Along with the Port Mann, expanding Highway 1, the SFPR (all funded and being built) and long before the NFPR, the Massey Tunnel or Pattullo – the New Westminster Bridge was the critical almost-missing link. ignore the big, showy, youthful, orange bridge next to it! Yet the Gateway Program has been silent about this imperative issue. Nothing has been done for several reasons; at least part being the difficulty of building an adequate replacement (read: two tracks, and not a swing or lift bridge that impacts rail schedules) in the spot where the bridge currently resides. 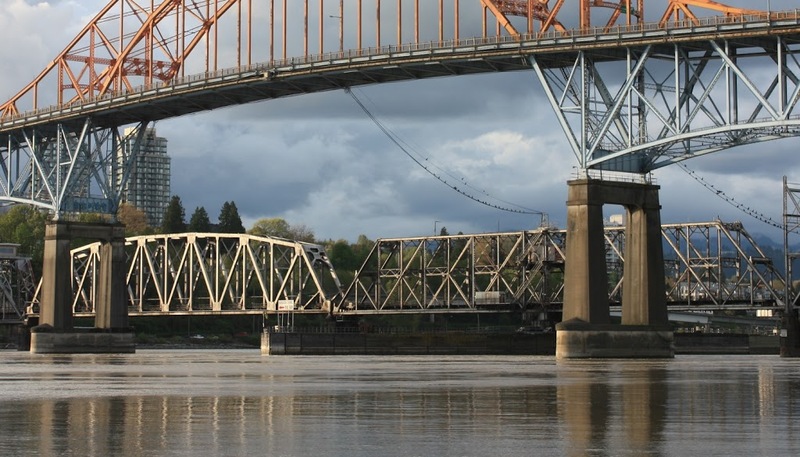 Trains hate hills and the Navigable Waters Act requires minimum clearance over the River for fixed bridges: the Pattullo has 45m, the New Port Mann about 42m. The ground on the Bridgeview Side has an elevation of about 3m above the River, meaning the bridge would have to lose something like 40m between midspan and Surrey. That isn’t a problem if you are driving a car – a 6% slope is almost invisible to a car, and would require a 650m-long ramp, not unlike the current Pattullo approach. However, to a freight train, that is an insurmountable slope. Trains require a slope closer to 2%, and consequently the offramp on the Surrey Side would need to be 2km long! For this reason, the idea of a tunnel under the Fraser at that point was considered in that same 2003 report on regional transportation needs. The navigable channel under the bridge is maintained to 10m depth through the dredging program (to accommodate 11m draft ships at least two hours a day – tides and freshets really mess with elevations when you use the top of an estuarine river as a datum – good thing we have geographers!). So the bottom of the tunnel would need to be something like 20m down, requiring a km-long slope from mid-stream to the surface at Bridgeview. Long, but not unmanageable considering most of it will be underground. The New Westminster side gets more interesting, though. The current train bridge hits the land at about 5m above the river, just above Front Street. From the north pillar of the bridge, McBride would only be about 200m distant. 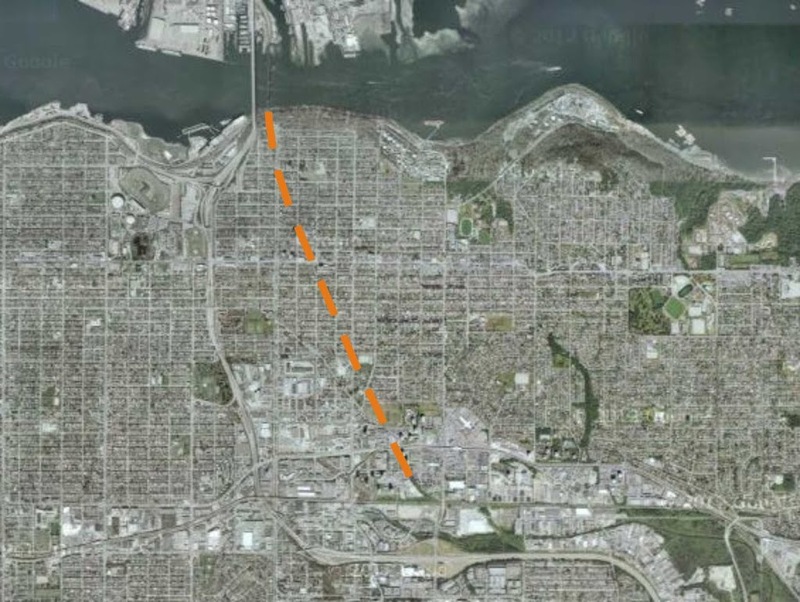 A new 40m-high rail span could therefore only slope down to about 35 m elevation over that distance, which would put the rails on the green grass slope above Columbia Street. I cannot imagine how to connect those rails to the existing rail network without some sort of aircraft carrier-style elevator. Bring an under-river tunnel in 20m below grade, and you can similarly forget connecting to the existing east-west rail line under the Pattullo Bridge. A new east-west connection would be required, and this is where things start to get exciting for New Westminster, as the only logical connection is a tunnel under New Westminster. A tunnel that connects the rails yards at Sapperton to the rail yards at Quayside. I can think of two ways these tunnels can go. But first, look at the current layout of rail lines in New Westminster. 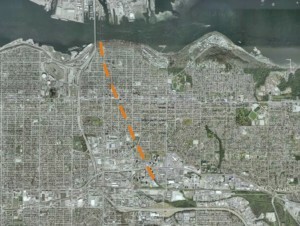 Existing rail lines in New Westminster, click to see bigger version. A dreamer would envision three tunnels, each of them about the same length as the existing rail tunnel under North Burnaby. These tunnels would generally be deep-bored tunnels, not cut-and-cover, so there would be few issues with utilities, archaeological sites, or contaminated sites. Luckily, the materials that make up New Westminster hills are pretty competent and easy to drill (mostly sedimentary rocks of the Eocene Huntington Formation, if you care to know). Tunnel Ventilation Structure at Frances and Ingleton in North Burnaby. Still Creek area to the Second Narrows – the only Rail Crossing of Burrard Inlet. So envision this tunneling scheme (obviously diagrammatic – concept, not details) and think about the realized synergies! well below City infrastructure. Red lines are retained surface rail. Click to enlarge. We remove the bottleneck at the New Westminster Bridge by exapnding it to two rails and removing the swing bridge schedule hassles (remember, the #1 priority for goods movement in the region). This also opens up numerous possibilities for commuter rail, improved Via/Amtrak service, and opens up valuable industrial land in Surrey that now has long rail ramps on it. There is no longer a reason to connect the Sapperton rail yard to the Quayside rail yard via east Columbia and Front Street. Those two yards can be connected via the east-west tunnel connecting the Hume Park area to the west foot of 4th street. The rail companies will no longer have to deal with the level crossings between the two, along with the speed limits, traffic and pedestrian issues they present. We have just achieved whistle secession between Braid and Stewardson. The unnecessarily-complex level crossing at the foot of Braid would see a fraction of the rail traffic it sees now, as it would only see use as access to the small BNSF yard at Sapperton and spurs into the Braid Industrial Area. It would effectively dead-end at Sapperton Landing Park. The through-trains would be in the tunnel, resulting in fewer trains across these routes and increased safety and predictability for drivers. mostly below City infrastructure. Red lines are retained surface rail. Click to enlarge. We lose some of the benefits of simplification of the Braid intersection, but perhaps gain a consistency with the existing rail operations, although many of those operations in areas impactful on the City will be moved underground, just to allow acceptable grades between the sub-river tunnel and the existing rails at Sapperton and the Quayside. The total tunnel length is reduced (one 3.2km tunnel instead of three tunnels totalling almost 7.2km), but the interaction with existing utility, road and rail infrastructure is greater, and therefore the construction costs may not be much lower. There are people much better trained than I to advise on which actual tunnel configuration is optimum! Another argument for these tunnels is that they help solve some of our actual traffic congestion problems. Every container that is on a train is a container that is not on the road. This project improves the competitiveness of the train system for moving goods from Vancouver Harbour and the DeltaPort to points east (including the intermodal yards in the northeast sector and the industrial areas on Annacis), and it moves all of these containers without trying to share space with other trucks, cars, buses bikes, and the livebility of our city. Yes, it is up to 7.2 km of tunnelling, but compared to a cut-and-cover McBride tunnel which would be the longest road tunnel in Canada, none of these rail tunnels would be longer than the existing Burnaby tunnel, and combined length they would be much shorter than the longest rail tunnels in Canada- actually a combined length similar to the combined bored and cut-and-cover tunnel for the Canada Line, except without all the expensive underground station costs! So to summarize: we make the Port and rail companies happy by removing the big bottleneck at the New Westminster Bridge, we remove a significant number of level crossings, open up our waterfront, re-claim valuable downtown land for non-rail use, achieve our whistle cessation goals, and improve the Braid crossing safety issues, while improving rail connectivity and freeing up community streets. All for a cost that would likely be much less than that for an imagined cut-and cover tunnel solution for cars. Here is a tunnel idea I could support. May be the tunnel could need to be deeper to lfit new Panamx draft? But what about a moveable bridge. like a moveable bridge with a deck allowing 12m clearance in closed position. Notice, this bridge has many features similar to the Golden Ears one, but for a quarter the cost! when you have this new tunnel/bridge, you still have the White Rock bottle neck…what about the new rail crossing around PortMann bridge, and then lay new track roughly along 176st right from the river to the border. (laying new track in country side could be cheaper than dig approach kms of approach tunnel (here you are talking 2km of approach tunnel at 2% – single track 10meter diameter tube …) and I guess a viaduct approach even at 10 meters high along the NewWest Waterfront could be a tough sell. Yeah it would be interesting to see how a 12m clearance swing/lift bridge would operate, it would allow the daily barges and tugs to get through, but keep the possibility for (very) occasional larger vessels to pass. I’ll have to think more about how the resulting tunnels on the New West side would work (as surface rail connectors would be a non-starter at 10m elevation). I also I don’t think we need to think about Panamax dredging up that far. They would need to go to 12m+ (or 15m + for New Panamax) which is quite a bit more than they do now above Annacis, and of course it would be useless until after they replace the GM Tunnel. Moving the bridge/crossing to Port Mann area would mean a longer crossing less well attached the existing rail systems, and wouldn’t provide any reason to get the rail off of the New West waterfront! So in this case, New West WANTS a new crossing!